Central San Diego Black Chamber of Commerce recently issued the following announcement. 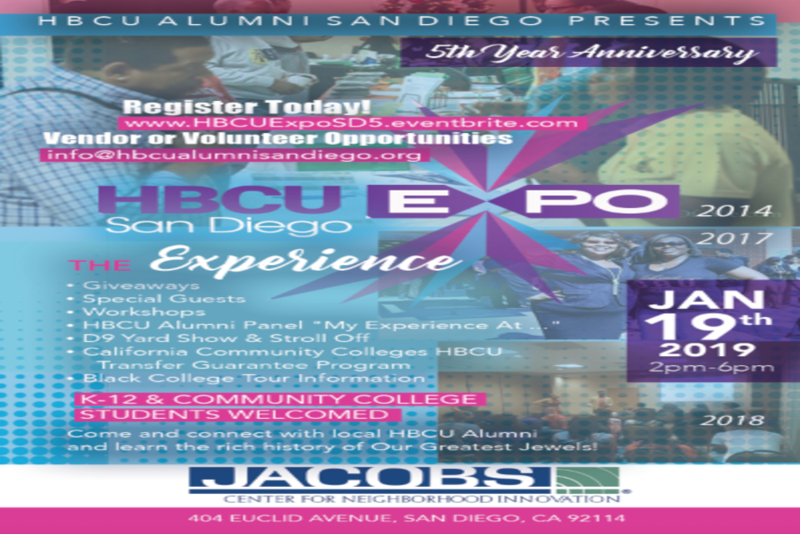 HBCU Expo San Diego will have its 5th Year Anniversary on Saturday, Jan 19, 2019, from 2-6pm at Jacobs Center for Neighborhood Innovation. This event is open to all students K-12 and Community Colleges. Many workshops scheduled throughout the afternoon, past workshops included: Culture Shock (psychologically adapting from minority to majority), The HBCU STEM Experience (interactive and trivia of STEM), Access Granted (navigating the HBCU Admissions process), Financial Aid, HBCU Pennant Factory (arts and crafts for students) and many more! Want to get notified whenever we write about Central San Diego Black Chamber of Commerce ? Sign-up Next time we write about Central San Diego Black Chamber of Commerce, we'll email you a link to the story. You may edit your settings or unsubscribe at any time.